Citation: Mondal MdIH, Ahmed F, Fakrul Alam ABM. Synthesis and Grafting of Carboxymethyl Cellulose from Environmental pollutant Cellulosic Wastes of Textile Industry. Res Rev Polym. 2016;7(2):102. Carboxymethyl cellulose (CMC), was synthesized from cellulosic rag, a textile waste of textile and garment industries in aqueous ethanolic sodium hydroxide and subsequently mono-chloroacetic acid reaction medium. Low substituted to high substituted products were obtained from single step to seven step carboxymethylation of cellulose. In this way, it was possible to produce low cost and different grades of substituted carboxymethylated cellulose. The synthesized CMC was characterized and their physical properties were investigated. Solubility, CMC content, degree of substitution and molecular weight of CMC were increased gradually with the increase of the number of reaction steps, although fourth step attained the optimum. The degrees of substitution of CMC from one to seven reaction steps were 0.90 to 2.84, respectively. Similarly, CMC content and molecular weight of CMC were 72.60% to 85.00% and 153,886 to 252,231, respectively. The structure of CMC and grafted CMC were investigated by FTIR, 13C NMR and SEM. The prepared CMC was applied as a sizing agent to develop the physico-chemical characteristics of fabric and yarn as well. Grafting of prepared CMC film with methyl methacrylate (MMA) monomer increased their strength 86.11%, although decreased rigidity and moisture content due to the incorporation of hydrophobic MMA monomer was observed. Carboxymethyl cellulose (CMC) is one of the most versatile cellulosic derivatives of the present day world and tremendously used in textiles and many other industrial fields including food products, paper, cosmetics, pharmaceuticals, and adhesives . Hence it is most important in the textile manufacturing and in everyday life. It is true for present day that Bangladesh is a textile industry-based country and large amount of CMC is being imported to meet its demand for textile sector in every year and the importance of CMC is increasing day by day . It has been reported that CMC was prepared from different cellulosic sources by different researchers following many different methods [3-8]. Many researchers have investigated the synthesis of CMC from different cellulosic sources, such as paper sludge , hyacinth , wood residue , cotton linters [8,9], bagasse , etc. No worth mentioning work has been performed on the synthesis of CMC from knitted rag. Knitted rag contains high amount of good quality α-cellulose which is 95% to 98% , and huge amount of knitted rags are deposited as textile wastes in different garment industries that have virtually no use. The wastes contain both coloured and non-coloured rags. These are normally dumped in nearby area, and degraded naturally. Hence these created environmental pollution. As the rags contains high amount of good quality α-cellulose, it can easily be collected with almost free of cost and it will be a great source for the manufacture of CMC and other derivatives. The purpose of the present work is to explore the use of these knitted rags by synthesizing different grades of CMC by applying multiple steps carboxymethylation techniques. In this report, a multiple step carboxymethylation techniques will be adopted for producing lucrative CMC, with good solubility and fair degree of substitution (DS). The unique feature of this report is the reuse of the recovered ethanol used in carboxymethylation, the synthesis of CMC with high DS, the synthesis of grafted CMC, and the application of CMC to textiles. Ethyl alcohol (Merck, Germany), sodium hydroxide (Merck, India), mono-chloroacetic acid (BDH, England), sodium carbonate (BDH, England), standard carboxymethyl cellulose (BDH, England), etc. were purchased as analytical grade and used without further purification. Preparation of sample: The knitted rag, a cellulosic raw material, was collected from Mozart Knit Limited, Ashulia, Saver, Dhaka. The collected knitted rag, a wastes of garment industries, contains both non-coloured and coloured rags. The coloured knitted rag was washed with 1% Na2CO3 solution at 60°C . The colored knitted rag was immersed in bleaching liquor containing 4% (w/w) of 35% (w/w) hydrogen peroxide, 2.5% sodium silicate and 1% sodium hydroxide on the basis of fibre in the rag-liquor ratio of 1:50 at 40°C for 1 h. Then the temperature was raised to 85°C and continued for 3 h with occasionally stirring . Finally the non-coloured knitted rag was washed with sufficient fresh water and then dried in air. (a) Basification: The first step provided the formation of a reaction mixture (1 g knitted rag) comprising a solution of an 18% aqueous ethanolic NaOH carefully controlled to 30°C for 3 h with occasionally stirring. This step is known as steeping. (b) Etherification: In the second step, an 80% (w/v) aqueous mono-chloroacetic acid (ClCH2COOH) was added drop by drop to the previous mixture and carefully controlled its temperature to 50°C for 6 h. This step is known as carboxymethylation step. Single step carboxymethylation gave only low substituted product. Highly substituted CMC can be prepared by performing multi-steps carboxymethylation of the cellulose. In each step, prepared CMC of immediate previous step was purified with 80% aqueous ethanol solution and then carboxymethylation of this low substituted CMC was done with fresh addition of NaOH and ClCH2COOH. Finally the synthesized crude Na-CMC was purified with 80% ethanol solution, and then dried in a desiccator over P2O5. where, A is the milliequivalents of sodium hydroxide required per gram of sample. where, K is the constant, a is the polymer shape factor, [η] is the intrinsic viscosity and M is the molecular weight of Na-CMC, using Oswald viscometer at 35°C. where, M1 (g) is the weight of sample before wash and M2 (g) is the weight of washed sample. where, V (ml) is the amount of AgNO3 solution and M (g) is the weight of dried sample. where, A is the weight of the grafted CMC film after modification; B is the weight of ungrafted CMC film before modification and C is the weight of total monomer used. where, W0 is the weight of air dry film and W is the weight of oven dry film. where, W is the weight after immersion and W0 is the weight before immersion. where, W0 is the weight before extraction and W1 is the Weight after extraction. Tensile strength: To determine breaking load of CMC film and modified CMC film with MMA were measured by using the Tensile strength tester (Harada Co. Ltd. Nagano–ken, Japan). Length of the film between the jaws is 1 cm. Identification of CMC and graft: The washed knitted rag and prepared CMC was dried at 50°C and was made it fine powder using motar-pastle. This powder sample was mixed with KBr in the ratio of 1:125 and a pellet was prepared. Then, IR-spectra of this KBr pellet was recorded with a FTIR spectrometer (Model: FTIR-8900, Shimadju, Japan). The synthesis of Na-CMC from knitted rag (1 g) was carried out according to the Scheme 1. The potentiality of the process is the re-use of ethanol after washing of crude Na-CMC. The effect of solvent system, alkali concentration for basification, concentration of mono-chloroacetic acid for etherification, time and temperature of the reaction for the degree of substitution (DS) were studied. The reaction was optimized with respect to the DS by varying each of the parameters. The yield of Na-CMC, DS in Na-CMC and molecular weight of Na-CMC obtained from carboxymethylation process at one to seven steps are shown in Table 1. 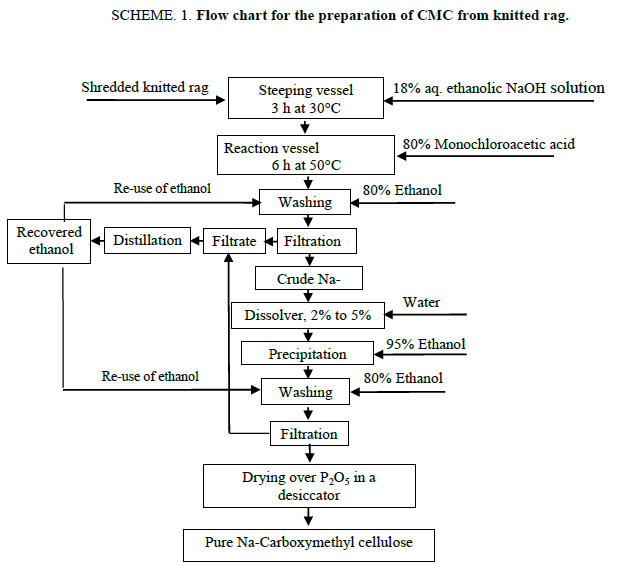 Scheme 1: Flow chart for the preparation of CMC from knitted rag. Molecular weight of Na-CMC was calculated by using ?Mark-Houwink-Sakurada? equation, where the value of ?K? and ?a? are 37 × 10-5 dl/g and 0.61 at 35°C respectively . Table 1: Determination of yield of Na-CMC, DS in Na-CMC and molecular weight of Na-CMC from knitted rag at different reaction steps. The optimized conditions for the synthesis of Na-CMC was established as, ethanol to cellulose ratio, 12:1 (v/w); water to cellulose ratio, 2:1 (V/W); overall concentration of NaOH, 18% (v/w); steeping time, 3 h; steeping temperature, 30°C; concentration of monochloroacetic acid, 80% (v/w); time of carboxymethylation, 6 h; temperature of carboxymethylation, 50°C. It can be seen from Table 1 that yield of CMC increased with the increase of the number of reaction steps in the optimized condition of carboxymethylation. The yield of Na-CMC in first step of carboxymethylation in aqueous ethanolic solution is 360%, but for the second to seven successive steps these were 751% to 1494%, respectively. Solubility of the produced Na-CMC samples was tested in water. The Na-CMC obtained from multiple steps carboxymethylation showed a highly solubility in water than the product of single step. The role of the solvent in the carboxymethylation reaction is to provide accessibility of etherifying reagent to the reaction centre of the cellulose chain . The carboxymethylation reaction was optimized with respect to DS by varying each of the parameters. The DS of the prepared Na-CMC was determined by the acid-base titration method . The DS data of all steps are listed in Table 1. It can be seen from Table 1 that DS increased very fast at the initial step but after the 4th step, the increasing rate of DS is slow. The reason of this phenomenon was due to the fast substitution reaction for initial steps under alkaline conditions. The hydroxyl group of cellulose in knitted rag was very active and could be replaced by carboxymethyl group, which decreased the number of OH groups very fast. The molecular weight of Na-CMC obtained from each step was determined by viscosity measurement. The viscosity measurement of each Na-CMC sample was calculated by using “Mark-Houwink-Sakurada” equation , [η]=KMa. From Table 1 it can also be seen that the molecular weight of the prepared Na-CMC increased gradually with the increase of reaction steps from step one to seven. The reason is that as the DS increased with successive steps, number of OH groups attached to cellulose molecule was replaced by carboxymethyl groups. As the molecular weight of carboxymethyl group is higher than the OH group, the molecular weight of final product Na-CMC also increased with the reaction steps. Table 3 shows that increase of DS and molecular weight was string down with the number of successive steps indicating the DS of Na-CMC went on to the completeness of the substitution reaction. The amount of CMC, NaCl and others contents in Na-CMC are listed in Table 2. From Table2 it can be observed that percentage of CMC and NaCl increased gradually with the increase of DS and number of reaction steps and at the same time percentage of other materials decreased. This result confirms the increase of CMC with the increase of reaction steps. Table 2: Determination of grafting properties of 2% CMC film. The effect of the monomer (MMA) concentration on modification of CMC in the presence of a K2S2O8/FeSO4 redox system is shown in Figure. 1. The graft yield increased with the increase of monomer concentration and after a certain value, it decreased with a further increase in the monomer concentration. The latter is due to the increasing homopolymerization rate rather than to grafting at the higher monomer concentration. The maximum graft yield is 20.6% when the CMC was treated with 80% MMA. The grafting efficiency is 19.4%. 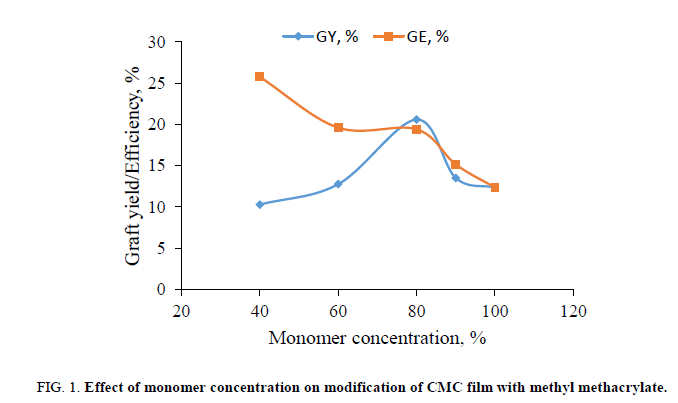 Figure 1: Effect of monomer concentration on modification of CMC film with methyl methacrylate. The physical properties of CMC and grafted CMC, such as moisture content, water absorption, gel content, tensile strength and elongation at break listed in Table 3. From the Table 3, it can be seen that moisture content and water absorption value of CMC are 2.86% and 7.69% respectively. These values are much higher than the value of grafted CMC with MMA. This indicates that MMA had been successfully grafted incorporated with the prepared CMC film and due to the incorporation of MMA, the grafted film lost its moisture absorption capacity. The gel content of grafted film is 97.03% which is lower than CMC film. The high gel content means the high reactivity . It is proved that MMA had been successfully grafted on to prepared CMC film. From the Table 3 it can be observed that breaking load and elongation of CMC film is 0.72 MPa and 2.6%, respectively. Whereas grafted CMC film is 1.34 MPa and 1.7%, respectively. This result shows that the tensile strength of grafted CMC film is higher than CMC film and elongation at break is lower. The tensile strength of grafted CMC film is higher due to the incorporation of MMA monomer onto CMC film and this reassembly increased the rigidity of the grafted film and hence lower elongation at break. Table 3: Determination of CMC, NaCl and others in synthesized Na-CMC. The FTIR spectra of standard CMC film (DS=0.8), prepared CMC film (DS=2.71), and MMA-grafted CMC film are shown in Figure.2. From Figure.2, it can be seen that the peaks assigned at 1630 cm-1 and 1420 cm-1 indicate the presence of carboxymethyl substituent in both standard CMC and prepared CMC films (Figure. 2(b,c)). The carboxylate ion  gives rises to two Peaks: a strong asymmetrical stretching Peak within 1650 cm-1 to 1550 cm-1 and a weaker symmetrical stretching peak near 1400 cm-1. Two weak peaks near 1630 cm-1 and 1420 cm-1 in cellulose was observed which are due to absorbed water and CH2, respectively. Hence the occurrence of strong peaks in CMC films confirmed the formation of CMC by the process of etherification between knitted rag and mono-chloroacetic acid in strong alkaline alcoholic medium. An extra absorption band at 1741 cm-1 was observed in grafted CMC film indicating the stretching of C=O group, which was the introduction of ester carbonyl group of the grafted MMA [20,21]. So the appearance of new peak in the spectra of CMC film-g-MMA gave supporting evidence for the grafted product and suggests that MMA had been successfully grafted onto prepared CMC film. 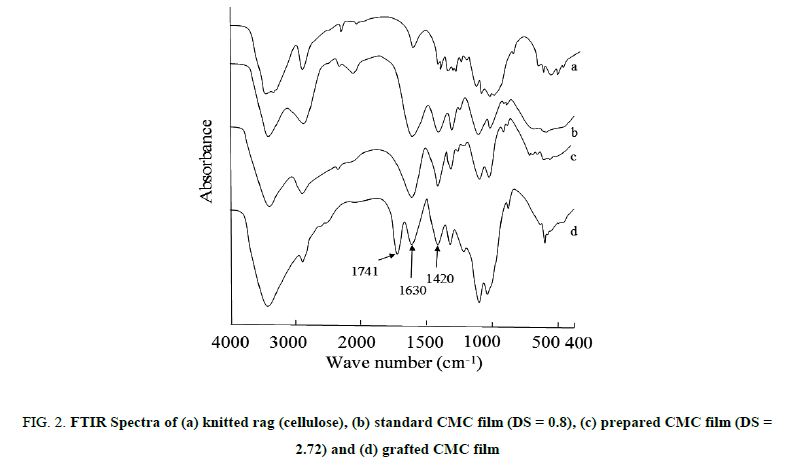 Figure 2: FTIR Spectra of (a) knitted rag (cellulose), (b) standard CMC film (DS = 0.8), (c) prepared CMC film (DS = 2.72) and (d) grafted CMC film. The authors would like to acknowledge the Ministry of Education in Bangladesh for funding the project as Higher Education Research Grant in 2011 (Project no. MoE/Branch 17/ 10 M-15/ 2007 (Part-2)/40 (36). Bokias G, Mylonas Y, Bumbu GG, et al. Synthesis and Aqueous Solution Properties of Novel Thermoresponsive Graft Copolymers Based on a Carboxymethylcellulose Backbone. Macromolecules. 2001;34(14):4958-64. Parith DV, Sachiurata ND, Calamari TA, et al. Carboxy-methylated cotton for moist wound healing. AATC Review, American Association of Textile Chemist and Colorists. 2003;3(6):15-9. He X, Wu S, Fu D, et al. Preparation of sodium carboxymethyl cellulose from paper sludge. Chem TechnolBiotechnol. 2009;84(3):427-34. Barai BK, Singhal RS, Kulkarni PR. Optimization of a process for preparing carboxymethyl cellulose from water hyacinth (Eichornia crassipes). Carbohydr Polym. 1997;32(3-4):229-31. Whistler RL. Methods in Carbohydrate Chemistry (Vol. III). London: Academic Press; 1963. Togrul H, Arslan N.Production of carboxymethyl cellulose from sugar beet pulp cellulose and rheological behaviour of carboxymethyl cellulose. CarbohydrPolym. 2003;54:73. Egbuchunam O, Okicimen EE.Carboxymethylation of Wood residues: Effect of etherification process variables. IndJ Chem Technol. 2003;10:619-22. Nagieb Z, Sakhawy ME, Samir K.Carboxymethylation of cotton linter in an alcoholic reaction medium. IntJPolymMater. 2001;50:163. Jahan IA, Sultana F, Islam MN, et al. Studies on Indigenous Cotton linters for Preparation of Carboxymethyl Cellulose. Bangladesh J Sci IndRes. 2007;42(1):29-36. Hussain MG, Ali MM, Chowdhury MFKN, et al. Bangladesh JSci Ind Res.1997;32:207. Herman F, Conrad J, Perlman JM. Encyclopedia of Polymer Science and Technology. Plastics, Resins, Rubbers, Fibers (Vol 3). New York: Interscience Publishers; 1965. Trotman ER. Dyeing and Chemical Technology of Textile Fibres. 6th ed. New York: John Wiley & Sons Inc.; 1984. ASTM. Tentative methods of testing sodium carboxymethyl cellulose. ASTM: 1439-61T; 1961. p.1164. Brandrup J, Immergut EH, Grulke EA. Polymer HandBook. 4th ed.New York: John Wiley & Sons Inc.; 1998. Mondal IH, Uraki Y, Ubukata M, et al. Graft polymerization of vinyl monomers onto cotton fibres pretreated with amines. Cellulose. 2008;15(4):581-92. Sikdar B, Basak PK, Mitra BC.Studies on graft copolymerization of acrylonitrile onto jute fiber with permanganate ion initiation system in presence of air. J Appl Polym Sci. 1995;55(12):1673-82. Mishra M, Mohanty AK, Singh BC.A study on grafting of methyl methacrylate onto jute fiber (S2Omath image-thiourea redox system). JApplPolymSci. 1987;33:2809-19. Lin OH, Kumar RN, Rozman HD, et al.Grafting of sodium carboxymethylcellulose (CMC) with glycidyl methacrylate and development of UV curable coatings from CMC-g-GMA induced by cationic. Carbohydr Polym.2005;59:57-69. Silverstein RM, Basster GC, Morril TC. Spectrophotomtric Identification of Organic Compounds, 5th ed. New York: Wiley; 1991. O?Connor RT, duPre EF, McCall ER.Infrared Spectrophotometric Procedure for Analysis of Cellulose and Modified Cellulose. AnalChem. 1957;29(7):998-1005. Adinugraha MP, Marseno DW, Haryadi PY.Synthesis and characterization of sodium carboxymethylcellulose from cavendish banana pseudo stem (Musa cavendishii LAMBERT). CarbohydrPolym.2005;62:164.